Joanna Masters-Maggs, our resident repeat-expat Food Gossip and Creative Chef, is back with her column for like-minded food lovers. “I heard that wine makers in the Napa Valley have found that picking grapes at night yields better wine,” I said to my husband as we walked the dog around our little neighbourhood. He followed my line of vision to an apricot tree, which, every June, heaves with the luscious yellow fruit. “I still think it would be a stretch for that snippet of hearsay to justify nicking the neighbour’s apricots to make jam,” he said. “As if I would think of it,” I snapped. But of course, I have thought of it, and often. After three years of living in France, I realize that I have entered into the kind of seasonal cooking that would make the hearts of certain editors of food magazines sing. Preserving has become a huge part of my life. Whenever I see a tree bursting with fruit, I am mentally pulling my preserving pan out of the pantry. Indeed, no tree is safe. My own cherry tree has been stripped bare of its rich dark cherries, which are now satisfyingly preserved in jars with wide red and white checked lids and little fruit decorated labels. Kitsch? Twee? Call it what you will. 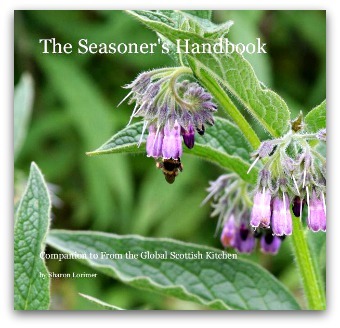 Seasonal preserving not only makes me feel smugly capable, it also provides a connection with a past where preserving was a necessity and not a lifestyle choice. 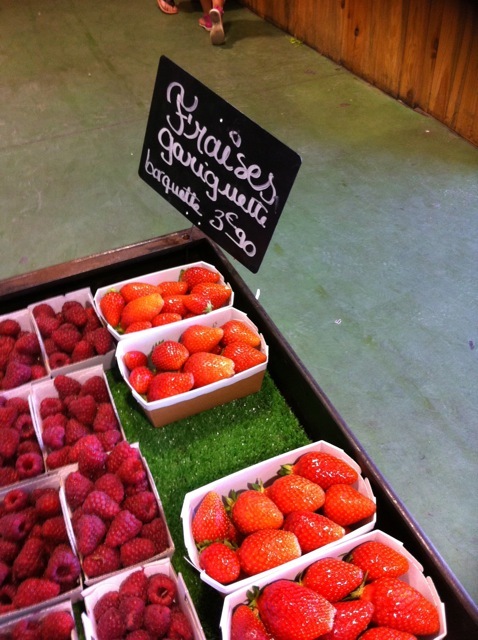 In France the changing seasons are very clear and marked by the varieties of available produce. This is not always the case in other countries where I have lived. Sometimes seasons are blurred due to imports for those able to pay, while in others there is a shortage of actual seasons. I have always thought we should be grateful Vivaldi was not born in Malaysia. Here in Aix I buy my fruit and vegetables in a large farm shop. As the year progresses, the produce changes. Strawberries come in around April or May and I watch the prices drop and drop until 4 Euros buys you 2 kilos and you are happy to macerate and preserve to your heart’s content. As the supply of strawberries peaks and peters out, in come the apricots, at jaw-droppingly low prices. In England I would feel guilty to pay that much and make jam, preferring instead to use fewer and to put them where they are visible. So the season goes on with harvests of figs, walnuts, grapes and avocados. Even after years of living overseas, it still amazes me that something as special to a Brit as artichokes or avocados can be displayed in barrels as if they were as common as potatoes in Ireland. I hope I never lose the delight in this aspect of expat life. I can get quite upset thinking of the English strawberry. The best of the best, produced in the county of my birth, Somerset, in the little village of Cheddar. Poor Cheddar, famous for its wonderful cheese, which has been knocked off and plasticized the world over until most people outside the UK don’t even know what real Cheddar is. On top of this, the reduction of its strawberry industry too. The problem was that for all its well-drained and optimal facing slopes, the season was only weeks long. It couldn’t produce enough fruit to satisfy the appetite of the nation which stamped its foot and demanded more and cheaper strawberries, and a longer season to boot. The nation should be careful what it wishes for. Fruit varieties have been tampered with and grown under plastic so that we can enjoy strawberries for longer than the two weeks of Wimbledon. Flavor has been compromised — of that there can be no doubt. But you can still buy the real thing in Cheddar, or grow your own, and it’s well worth doing if only to see what this fruit should actually taste like: strawberry, if you are interested, and not water. Then there are the imports. I am all for world travel, but not for soft fruit on which an indefinite travel ban should be imposed. The waxy Spanish strawberry is not only nearly devoid of the flavor of strawberry, but its texture is decidedly unappealing, being as coarse and waxy as an ageing fruit-pickers cheeks. How much do I love a good strawberry? A bushel and a peck and some in a gourd. Having said all that, I am (somewhat surprisingly) delighted to see the vast quantities of Spanish strawberries in my French market. There are two points in my rather shifty defense. Firstly, they are cheap, which justifies their use in jam. Turning a perfectly grown, traditional Cheddar strawberry into jam would be a crime, but boiling the heck out of the Spanish and adding sugar can only act to improve the flavor they lack. Secondly, the presence of the Carpentras strawberry gives a taste of how things should be. 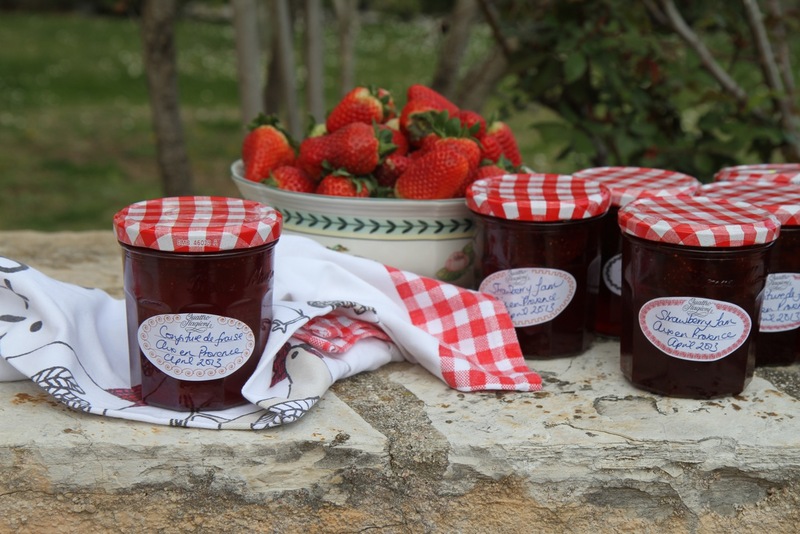 The village of Carpentras, in the Vaucluse region of Southern France, hosts a strawberry festival in April each year. I like to think of this village as Soft Fruit Soul Sister to Cheddar. Yet, unlike Cheddar, Carpentras has been successful, in that typically French way, of protecting its strawberry: as fiercely as Champagne growers have protected their name under a registered trademark since 1987. We have much to learn from them. Several varieties are grown. 90% of production is given over to the parajo, while its posher cousins, the ciflorette and the garriguette, are favored respectively by patissieres and those who like their fruit as it comes. These elite strawberries have retained their, well, strawberrishness with a deeper, fuller flavor. Price is higher but it is a price that locals and fancy restaurants alike are willing to pay for flavor. My favorite is the garriguette which, at 3.90 Euros this morning for 250g (16 strawberries), is nearly double the price of the regular Carpentras, but so well worth it. This is the taste of the homegrown strawberries I remember from my youth, complete with that rich, almost caramel-like flavour. Heaven, and worth every centime. So here in France I can enjoy quality in my tarts and quantity for my preserves, and that, I think, is a perfect combination. In England it is less of a clear cut and easy situation. Most of my local Pick Your Own farms have closed in recent years and, outside of two or three beloved greengrocers, everything is plastic punneted mediocrity. Not awful, but not good and definitely not strawberry. Back in France, as the year progresses, so my level of stress rises. Two batches of strawberry, one of cherry, brined olives rinsed and now bottled in olive oil, and apricot in the making, have placed considerable strain on my supply of jars. Yet I am always thinking greedily ahead. Figs are already on my mind, yet here I am in the throes of moving house. Somehow, the making of that Fig Confit must happen. I can’t miss figs at those sorts of prices. They must be preserved before my pans are packed. Or immediately after arriving at the new place before my boxes are fully unloaded. Will I be able to do it? I feel the panic rising. No amount of telling myself that I don’t actually have to do it this year has any effect. I have to. I must. It’s just the rhythm of the year and I can’t bear to miss the joy of opening a jar at Christmas in the midst of an English winter. Just a little ray of Provence sunshine from my other home on a cold, cold day. A little fig confit to serve with the foie gras adds a French touch to the festive season. The stress is intensive by that Apricot tree which still preys on my mind. Those wasted golden globes are just asking for my attention. It really would be a crime to let them wither on the tree. Wouldn’t it? GLOBAL FOOD GOSSIP: Stuffing a chair with boar’s hair, and your face with Charlotte Royale – British style, bien sûr. GLOBAL FOOD GOSSIP: Pastry or pie dough? Whatever you call it, it’s child’s play. 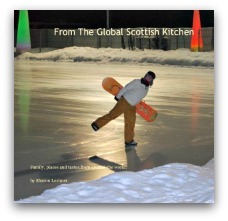 This month: Joanna despairs over the modern inability to enjoy the simple foods in expat life. UPDATE: Due to popular request after this post first went live, Joanna has included her recipe for the Beef and Guinness Pie she made for her St. Patrick’s Day party. Read on! Fair point — but I can’t help grinding the same old axe. I think that there is a lot of up-arseness the world over when it comes to food. Am I alone in being so irritated by people who call themselves “foodies” as though there is some sort of originality in their love of eating? The truth is everyone loves good food, but not everyone is lucky enough to get it that often. Have you ever met someone who smugly tells you that they have expensive tastes, as though no one else has ever wanted an Aston Martin or a Chanel suit? The very reason these things are desirable is because they are expensive and out of the reach of most. “Foodyism” isn’t much different. “Foodies” are just a bunch of people trying hard to be special, but they’re no different from anyone else. The sad result is that we have lost the confidence to love regular everyday food that speaks, truly speaks, of the place where we find ourselves. Drizzle with pomegranate coulis. Post photo to Facebook. Serve immediately. It’s the same the world over. No one cooks simple food for one another anymore. If we cook, it has to be restaurant worthy, or at least it has to look it. Those who can’t cook that way get hopelessly behind and become the kind of people who never invite back for a reciprocal dinner at their place. The expat is particularly prone to Food Narcissism. It’s just too easy and too tempting to show off unusual items we have seen in far-flung places. Or the exotic meals eaten in little places we have found in some unfashionable part of town. No one back home is going to know that the food stall we just happened upon has been featured in KL Expat Today, or Foreign Workers in Caracas, or some such publication. Gosh, I even irritate myself and it takes an intolerable level of smugness to be able to annoy yourself. 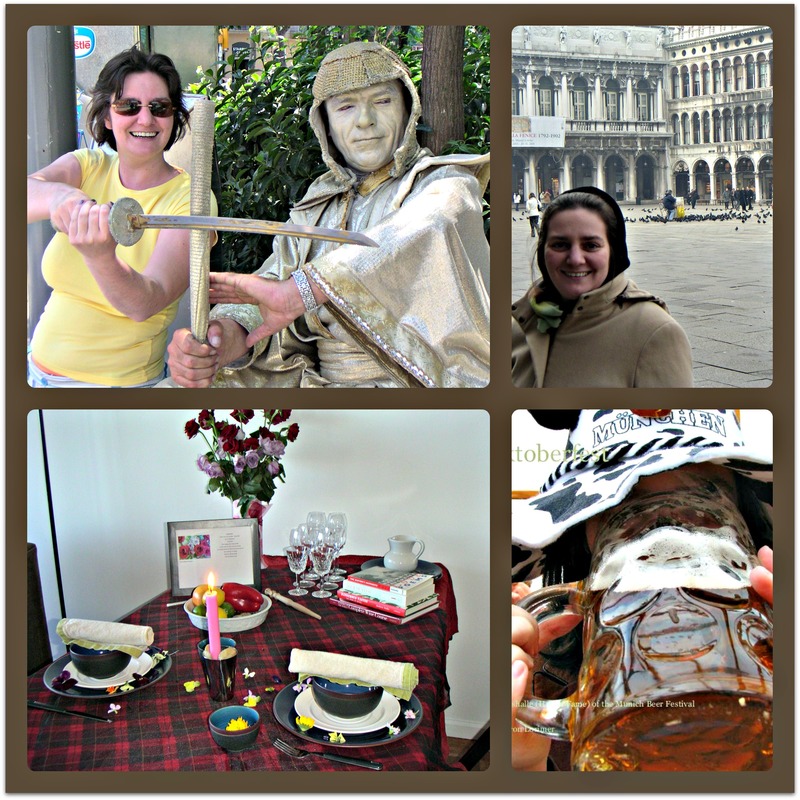 A few weeks ago I decided to get in touch with my Irish side and host a St Patrick’s day party. I agonized for a long time over what to serve. Many of my guests surprised me by not knowing what St Patrick’s Day celebrations entail. There was even a soupçon of concern over where to find green cocktail frocks, which only served to intensify my preoccupation with the menu. Although I reassured my guests that they were to wear anything green that they could find at home and were absolutely not to go out and buy a fancy frock, I realized I too was complicating what should be a fun and easy supper. It was horrible to realize that I was afraid to serve Irish food in case it was too simple and that my cooking might be seen as a bit dull, basic even. There I was, actually trying to tart up the Irish recipes to a degree where they would be indistinguishable from French ones. Little piles of salmon on delicate rounds of soda and individual servings of boxty (a sort of Irish rosti) piled up and garnished with drizzles of sauce. It was in dealing with the matter of the emerald-green silk dress hunt that I realized where my own lack of confidence in real food was landing me. How ridiculous. Instead of serving simple and comfortable food, I was trying to turn it into something fancy. Giving myself a metaphorical slap around the chops, I got a grip, squared my shoulders, and returned to basics. I would serve the food I grew up with. Irish Stew, Soda bread with salmon, and Beef and Guinness pie. Oh all right, not the pie. My mother wasn’t keen on making pastry at all, citing hot hands as her excuse, but actually we all knew she would rather settle down to a glass of Guinness and watch a simple stew take shape than hand-make pastry. But the rest, you get my meaning. The memories flooded back. The stew in a big, cream enamel pan on the hob, the warm soft “stocklike” aroma of cooking lamb on its bone with plain old carrots and potato punched up with plenty of pepper, white pepper, and of course the resulting condensation on the kitchen windows. Culinary childhood in a bowl. We expats often live behind a two-way glass where we do not socialize with the people around us. Barriers — language, cultural, time, work — impede us. Yet the rare glimpses into the everyday life of the places where we live create the most special and evocative moments. Food produces some of the strongest memories. Memories of great restaurants are one thing, but home cooking is another thing altogether, being a part of the fabric of everyday life. I was lucky enough to have a maid when I lived in Brazil. At the time I thought I was lucky to have someone to help with the housework and kids, but in retrospect, I realize that she represented so much more than that. She made a Maria-shaped hole in the glass I lived behind, bringing some of the everyday world of a Carioca (someone born in Rio) into my kitchen. Every Monday, Maria would arrive ready to cook up a few days’ supply of black beans. These shiny black nuggets were blasted soft in a pressure cooker, then cooked with onions, a large pile of garlic and a few bay leaves then cooked long and slowly into rich and satisfying stew. The secret to getting a great flavor into these beans is the addition of salted pork extremities to the mix. Ears, trotters, tails, you name it, are all used. As they break down in the cooking they have a thickening effect too. I had seen great piles of waxy, white and vaguely familiar items in the meat sections of supermarkets, but had given them a wide berth. Under Maria’s tutelage, I got over my silliness and grew to appreciate their value as they became an intrinsic part of my shopping list. The best times were when couve was available. Couve, or collard greens, deep green palm-like leaves, which she would roll up and finely slice and stir fry with garlic and seasoning and nothing else. A pharmacist once told me that folic acid isn’t really needed for expectant mums in Brazil. The combination of the beans with the couve produces a cocktail of minerals easily absorbable by the body and priceless in reducing the risk of spin bifida. Is there anything not to love in Brazil’s national dish? The black bean memory doesn’t include a fancy restaurant to boast of. No little food stall tucked away in the back of a very “local” area of town. Here was just a woman producing basic home food with the intention of filling an empty belly until the next day. These memories are more evocative of life in Rio to me know than my endless photos of Christ the Redeemer or Sugar Loaf Mountain. Maria made my experience of the place. So, despite all my talk, I haven’t been able to circumvent the curse of expat “showing offness”. For what I seem to be saying is that anyone can book a couple of weeks in Rio and see the sights on a safe and comfortable air-conditioned bus tour, but to have really experienced the place you need memories akin to the memories of childhood. Maybe; or perhaps the truth is a little kinder? Simple home cooking is an everyday experience. There is no need to photograph it or put it on Facebook because it happens all the time. It’s as common as teeth-cleaning or walking the kids to school. Because of that, we experience it directly and fully, since we are not watching from behind the tiny lens of a camera, video, or smartphone. Instead, it is the comfortable and expansive background of life which seeps into us, unnoticed, to become a collection of memories; memories that can be triggered by a kitchen aroma, or by the way a woman holds a knife to crush a bulb of garlic. After all, if a plate of madeleines inspired seven volumes of Remembrance of Things Past, perhaps I can be forgiven for the sameness of my own little bits of writing. Well — since you ask — rather well, actually. All eaten and, I hope, enjoyed, particularly the beef and Guinness pie. It a good thing that hot-hands skipped a generation. So I raise my glass of black velvet (Guinness and Champagne – a disaster for both drinks, but much fun) to simple home cooking. Slap a pan of stew on your tables, and put out a couple of bumper size pies and let everyone dig in. I, for one, will be repeating the experience. First make a beef and Guinness stew. This needs to be done a day in advance. but water will do if needs must. Handful of stoned prunes, chopped finely (finely) these will add depth of flavor but, ideally, not change the texture of the stew. Cut meat into 2.5cm cubes and roll in seasoned flour. Heat oil and quickly sear the meat in batches putting the sealed meat on a plate to one side. Return the meat to the pan and add any left over flour with the carrots, Guinness, stock and bay leaves. Bring the whole to a boil then cover and simmer for two hours. Traditionally this would have been cooked on the hob, but I think it is easier to pop the stew into a casserole with the lid firmly in place and cook at 140°C or 275°F for at two hours. At this point add the prunes, stir well, recover and cook for a further half hour or until the stew is thick. When the stew is ready, remove from the oven and wait until it is cool enough to place in the refrigerator overnight. I used to make a puff pastry for this pie, but I recently tried a Nigella Lawson recipe for pastry, which she gives for her chicken pot pie. It is a firm textured, but buttery pastry, which is ideal for a robust beef pie. Put the flour and cubed butter into a metal tray and shake to evenly distribute it over the metal surface. Place in the freezer to chill for 10 minutes (Nigella exhorts us not to skip this stage since this is the step that makes the pastry so easy to handle and so delicate. She’s so right! While the pastry is chilling, beat two of the eggs with two tablespoons of cold water and place in the fridge. Next, place the flour and butter into a processor and pulse until you have a fine mixture. Do this quickly, don’t be tempted to overwork the mixture as the texture will suffer. Add the eggs while the processor works until the mixture starts forming a ball, then stop. Now you can divide the dough into two, press flat, cover with cling film and chill. This mixture will make two medium size pies or one large one. I like to make a double quantity and freeze for another time. This is the part I like most, putting my homespun stew between two sheets of the Divine Ms Lawson’s pastry. I have yet to become bored by the idea. So, roll out the pastry to line whichever tins you wish to use. Please do use metal dishes, as you will neatly side-step the problem of a soggy bottom. Fill with the cold stew. Use the remaining egg to seal together the bottom and top of the pie and to brush the top. Place on a metal tray in an oven pre-heated to 200°C (400°F) for 20 minutes. You can protect your pie from burning, until the last minute, with foil, or you can pop it in naked and white-knuckle it. 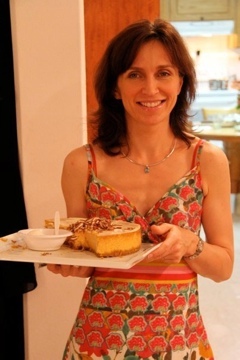 Joanna Masters-Maggs, our resident repeat-expat Food Gossip and Creative Chef, is back with her column for like-minded food lovers. This month: Coffee, the Achilles heel of French cuisine. 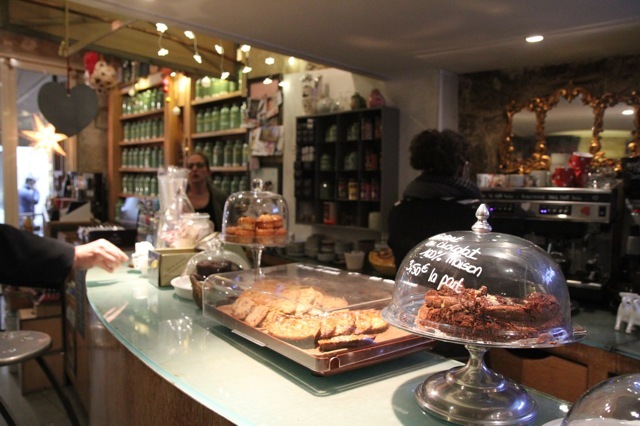 If you’re not a fan of Starbucks, France might just be the place to drive you there. If you can find one, that is. Why is French coffee in so unpalatable? It has the power to cause involuntary facial spasms and to make my stomach roil. At first I put these symptoms down to my taste buds being insufficiently sophisticated to appreciate its forceful nature. After two and half years, my friend’s comment helped me to recover some self-esteem and quit making a victim of myself. Maybe—just maybe—it’s not only me. I drink the tea this way, because that’s how I was brought up drinking it. We drink it for comfort, to stay awake, to go to sleep, or to get over a nasty shock. It comes with its own social language. Offering tea to an upset friend shows concern when we cannot find words. Failing to offer it to an unexpected guest says they should not expect to stay long. Giving some to a workman is a way to show your respect for them and to ensure a good job. Thus, overseas, tea is a rock of sameness I cannot let go of. In fact, it is the only overseas product I really must have if I must have something from home. It works for me. The coffee in France, therefore, should appeal to my rough taste in beverages. It is largely made from robusta beans which are recklessly roasted until the flavor verges on the acridity of all things cremated. It is drunk black, the addition of milk or cream deemed unsophisticated; ironic, given the rough, bad manners of the coffee itself. The tiny cups are instead dangerously laced with extreme amounts of sugar or sweetener and then downed rapidly in a way Mary Poppins would have approved of. And why not? Sometimes even the French should be allowed a break from tasting and judging good food and drink. My tea gives me the comfort and hit I demand, so why can’t I accept that the French should also be allowed, sometimes, to demand substance over style? With coffee, the French give themselves a break from the world’s demand for them to be so effortlessly chic. Coffee is not approached as is, say, wine, with a sort of intellectual or artistic mindset. The routines of coffee tasting are not observed. Whereas wine is lifted to the light, swirled, inhaled luxuriously and sucked over the tongue, coffee is knocked back as if by a Russian soldier engaged in long evening of vodka toasting. Coffee is not cupped with the hand to prevent the aroma escaping prematurely before the nose is lowered to inhale the intensified aromas. It is not sucked over the tongue to seek the full range of flavor. I must admit, it does the heart good to see the French behaving so badly. I understand, though, that this is changing. 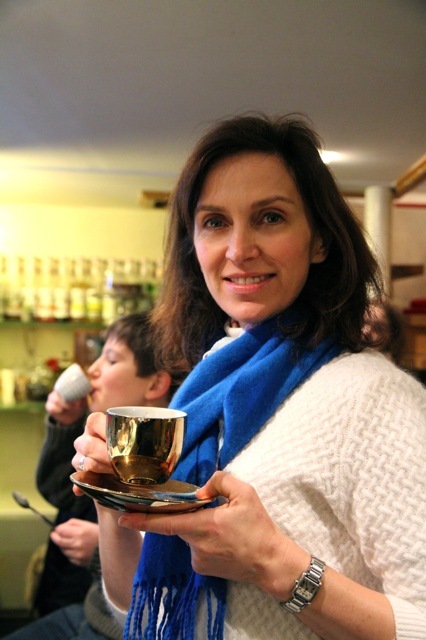 There are increasing numbers of little cafés which roast their own beans and grind to order. Little places where robusta beans are eschewed for the more subtle delights of arabicas. It’s been a while since I have had the time to hunt down these places in Paris. However, last week I was in Montpellier and had the great good fortune to find two of these hallowed places. Café Solo is an adorable place where the smell of coffee can be enjoyed a considerable distance from the front door even on a rainy February day. I had forgotten this smell. You don’t get it in a Starbucks or a Costa or any of the many similar establishments. The tiny interior is crammed with drawers of beans, a counter of homemade delights in little covered cake stands and, in a corner, a large roasting machine. 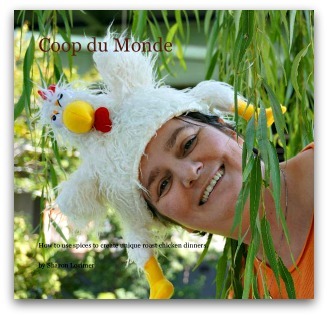 My family and I discovered it quite by chance while exploring the streets of Montpellier. Here we enjoyed what can only be described as a consultation with the artiste who would make our drinks. She listened to what we like and do not like, and pronounced her judgement on what would suit. Describing the flavours of each of the beans in that day’s selection, she guided our choice. Then we waited and watched while our coffee was made. It arrived in charming mismatched espresso cups and, thoughtfully, with little jugs of frothed milk– just in case. Hmmm—there was me thinking I am a coffee hooligan who needs the milky stuff, just like a kid, but I absolutely did not need a drop of it. My mocha bean from Ethiopia was soft and smooth with a tumble of flavours which lasted in the most pleasant way. It was a delightful surprise. I am so accustomed to a punch in the back of the throat from a tough one-dimensional over-roast. Not so here. “You see,” explained the artiste behind our coffees, “we French make terrible coffee. We just don’t know how to make it.” She smiled broadly, knowing full well that we could not agree with her. We found a similar place a few streets later and just had to go in to try another. Would it be possible to find two great coffees in one day? Yes, it was. This time Columbian for me; a bit more acidity, but absolutely no acridity. Lovely. Again, intoxicating smell of roasting coffee beans. As we returned to our hotel, nursing the residual flavor of our coffees, we saw a Nespresso shop and just had to go in. We knew that the chic, modern interior with its rows geometrically displayed and pristine pods as well as the absolute absence of the smell of real coffee would round off our day perfectly. Today that clinical chicness, instead of depressing us, would only intensify the memory of the delightful little stores we had just left. How deliciously wonderful it is to confirm how right I was. Clutching my bags of beans from Café Solo to my nose, I knew in that moment I would never succumb to the clinical pod. May my work surfaces be forever stained by the work of my little espresso machine and my walls stained by the periodic explosions to which the enthusiastic amateur is prone. I thought I had no sophistication when it comes to coffee, but, perhaps because I don’t drink tea for the tea itself, I do drink coffee for the coffee itself. I am much more open to trying different flavours and I am very willing to drink a lot of bad coffee until I find it. Since I can manage without coffee, I am not lured by the siren call of Nespresso machines, Starbucks, or any of the lesser places. I found absolute delight in those two shops which sell the stuff the way it should be sold. I am willing to keep trying everywhere, until I next hit coffee gold. Perhaps the next big discovery I will make is that the French acceptance of routinely bad coffee has freed them to become gourmet tea drinkers. It would be fun to think so. This month: The regrettable global takeover of the Cronut, and what should be getting the publicity instead. Those of you elsewhere — anywhere except France, that is — may laugh, but Seb’s assumption that a Cronut is German Shepherd-related rather than food-related was completely justifiable. My own ignorance of Cronuts and other “blended” pastries was only brought to my attention in December, when a friend living in Kuala Lumpur posted that they had finally arrived there. I think it true to say that the Cronut hasn’t yet arrived in France and probably never will. I do hope the same will not be the case for other treats that, my magazine suggested, will be sweeping tastebuds worldwide this year. I was particularly happy to see the arepa from Venezuela and Columbia on the list. My hips might not want to revisit my interest in these delectable goodies, but I am smacking my lips in anticipation. I first met arepas in Maracaibo, Venezuela, and our friendship deepened while I lived in Caracas. These flattened balls of unleavened maize flour-based dough are fried and then filled with a cornucopia of ingredients, depending on the region. North Western Venezuela, where I first fell in love with the arepa, has its own speciality, the Arepa Cabimera, whose filling consists of the improbable combination of cheese, jam, chicken and boiled eggs. You know when someone is eating a Cabimera as the arepas are unusually square. Other varieties often include queso guayanés — a mild, medium-soft cheese similar to mozzarella, shredded chicken and, if you are very lucky, crispy pork rind. The idea that I will miss such delights as they sweep the world is distressing, but our ignorance of the Cronut is a sad portent of what might come. How had the Year of the Cross-bred Pastry missed France? Perhaps it’s not such a surprise; France is not culturally inclined to faddy trends as is, say, London or New York. Why a “need-to-please” hybrid, when a classic, small, and delightfully buttery croissant is available? How intolerably vulgar to take such perfection and, presumably, add jam and deep-fry it. I can feel a thousand thin and elegantly clad Parisian shoulders shudder at the thought. Why? Why make a mash-up of existing pastries when you could come up with something less plagiaristic or stick with what already works? Oh, listen to me: maybe I do belong in France! After all, for each hybrid that works there are the unlucky ones in each batch which fail to inherit the best of both worlds and instead exhibit the worst of each. A croissant where the delicate buttery flavor has been killed by over-sweetening? A Labradoodle which sheds anyway and isn’t a pedigree but which costs the same and has the potential to inherit the congenital defects of two different breeds? What’s more, the frying of such a delicate thing as croissant pastry is not for amateurs. Getting the layers of pastry and butter to open in the heat of an oven is no mean feat; getting them to do the same in hot fat is entirely different. Apart from that, think how easily butter burns. That’s a lot of worry when pâtissierières across France already have mastered the art of injecting chocolate into croissants to make pain au chocolate or, better, almond paste. For me the almond croissant is the pinnacle of pastry pleasure. This marriage of crisp pastry with nutty and unctuous almond paste represents the Paul Newman and Joanne Woodward of the Pâtisserie. The Cronut is, as yet, a Brangelina wannabe and everyone is already asking how much longer is it going to last. The French disdain for change for change’s sake can be seen everywhere. Fashion classics which stand the test of time are valued over the new and the shocking. London fashion is all about iconoclasm and rebellion, rather than restraint. Surely, when it comes to food, good taste should not be derided. Maybe the French are right not to jump on the bandwagon of each new craze, instead waiting to see what stands the test of time and has what it takes to become part of the pâtisserie canon. I doubt that the Duffin will ever be the Little Black Dress of the pâtisserie world; certainly not with a name that makes it sound like something an ageing hippie would wear on a cold winter day in Glastonbury, UK. Hmm, pause for thought indeed. At least with baking, we can bin the rejects; we cannot do the same with our canine friends who don’t pass the successful hybrid test. How, then, can a modern culinary classic find acceptance in France? …let’s return to my arepa whose pedigree cannot be questioned. This is a traditional, tried and tested, and regionally variable dish. Given time, I am hopeful that the French, who enjoy regional variety in cheese and wine, should be open to accepting this newcomer. France has already embraced with overwhelming enthusiasm the pizza and tweaked it to French tastes – crème fraiche anyone? There is a little van with a wood burning stove on most street corners in every city, town and village of the country. For every Domino there are scores of restaurants, parlours, and vans, nearly all of them French owned and run. For the arepa this is hopeful news indeed. I may have to wait longer than a resident of London, Birmingham or, indeed, Kuala Lumpur, but I have hope that the Venezuelans are coming to Aix. Manal Khan, taken by her husband on a day trip to Segovia. The Displaced Nation is on a mission to celebrate the contributions made by borderless travelers and global residents to creative pursuits. Owing to our Western bias, we tend to feature Westerners who have ventured to other parts of the world, but there are plenty of other internationals who, too, deserve kudos—I refer to our counterparts in the less developed world, many of whom flock to the United States and Europe for higher education and employment opportunities, and in the course of that, find their own creative paths. Is that because they feel as displaced as we do? Perhaps I’ll uncover some answers in today’s post. I’ll be talking to journalist, poet, essayist, photographer, and storyteller Manal A. Khan, who says that she lives in fact, in fiction—and everywhere in between. Born in Pakistan, Manal has a journalism degree from Berkeley and has worked for an independent news organization in New York City. * Ironically, on the very day when Manal answered my request, she was awarded one of our Alices for a recent blog post that expresses, at one and the same time, her love for her native Pakistan as well as her discomfort with its social inequalities and excessive religiosity. What led you to compose these words? I wrote “Foreigner” eight years ago, during my college days in my hometown, Lahore. Pakistan is an extremely socially-divided country. If you happen to be born “privileged,” chances are you will get the best lifestyle, the best education, and the best work opportunities that the country has to offer. And if you happen to be born outside of that tiny privileged class—the middle-class barely exists in Pakistan—chances are you will be struggling most of your life just to put food on the table. I happened to be born into the former class, and while I know that I was fortunate, that terrible divide is something I could never reconcile myself with. And it was not just about money, or wealth. It was about culture, and language, and a sense of belonging. Pakistan used to be a British colony, and gained independence in 1947, along with the rest of the Indian subcontinent. But in many ways, we remain “colonized” by the English language. English is still the language of the powerful, of the elite, and a huge divider of class, culture and people. So all these different things were swimming in my head when I wrote the poem. You could say that I felt “displaced,” even when I lived in my native country. “Not Being” was written in New York. It was inspired by many different things, but the theme of not belonging, or not quite fitting in—in this case, to Pakistani society—is similar to “Foreigner.” For instance, the definition of a “good” Pakistani, according to accepted norms, is basic and black-and-white: intensely patriotic, passionate about cricket, virulent about America, and careful about fasting in Ramadan and attending Friday prayers; somebody who is dutiful to family, loyal to friends, lives up to expectations, and sticks to his or her roots. I was getting a lot of pressure, directly and indirectly, to be this sort of person from people I knew back home, and from feedback on my blogs published in The Express Tribune. I felt confused. I didn’t agree with or conform to any of those norms, so did that make me a “bad” Pakistani? The poem was an expression of that conflict. Was the audience you intended for these poems primarily Pakistani? To be honest, I intended no audience. I published “Foreigner” on Windswept Words a few years ago—it had been sitting in an old notebook till then; and “Not Being” only reached my regular blog readers. But now you mention it, I may submit the poems to one of the Pakistani blog sites I write for. It would be interesting to see people’s reactions. Did writing about these themes help you to process the peripatetic life you’ve led as a young Pakistani woman who went to j-school in California and has lived in New York City? Not only the poems, but most of the writing on my blog over the past few years has revolved around these themes. It’s interesting to see how one’s feelings of displacement evolve over time. Initially, when you are “fresh off the boat,” a foreigner in a foreign land, you feel compelled to uphold a sense of distinction, your separate identity (see my post “When in America, do as the Americans don’t”). At another level, you also want to assimilate, because you don’t to be viewed as an outsider forever (“Change”). And then there is that other level, when you stop waxing nostalgic and start viewing your own country critically (“The Freedom to Be”). Oh yes, definitely. My experience living abroad has changed me inalterably, and writing about it helps to make sense of things, to sift through the good and the bad of places, situations. You also translate Pakistani stories into English: I’m thinking of your work-in-progress “The Legend of Saif-ul-Malook.” Can you tell us how that got started, and the audience you hope to reach with these tales? Oh yes! 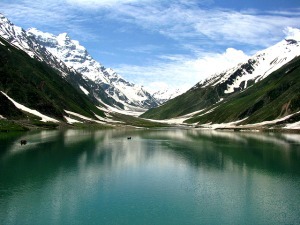 Saif-ul-Malook is the name of a beautiful lake located in the Himalayas, in the northwestern province of Pakistan. It’s a breathtaking region, full of snow-capped mountains, lush pine forests, and startlingly blue lakes. When I was growing up, our family would travel to the mountains every summer, driving from the torrid heat of flat and dusty Lahore to the cool green valleys of Kaghan, Swat, Nathiagali. I first visited Saif-ul-Malook when I was 12 and fell in love with the place for its beauty and for the enchanting legend associated with it, a fairytale that has been penned in several local languages but never in English. So, the next time I went there (four years ago), I was sure to take an audio recorder and capture the full version of the story in the words of the resident raconteur. This I transcribed, translated into English, and re-wrote with my own little additions (see “The Legend of Saif-ul-Malook Part I”). I have still to write the last part, the epilogue. But the response I’ve received to the story has been truly wonderful, and so encouraging. English-speaking Pakistanis are thrilled to find this favorite tale of theirs in an accessible form. Where did you meet your husband, and does he share your feelings of being between cultures? I met my husband in Lahore many years ago. Like me, he grew up in Lahore, though his family is originally from a Pashtu-speaking tribal region of northwest Pakistan. He also studied in the U.S., and we both lived and worked there together, so, yes, he does share many of my feelings about being in between cultures. But he does not dwell on it as much as I do; he is quite at peace with himself, wherever he is and whatever he is doing. I, on the other hand, have to think and think and write and write before I am able to find that peace, that balance, the position where I stand and where I am comfortable! Still, it helps a lot to be able to discuss these things with him. He is also always my first reader! In your search for that peace and balance, as you put it, do you recall one moment in particular when living in America that stands out as your most displaced? I can’t think of any one moment in the U.S. when I felt especially displaced. I think it’s because I lived in such big, multicultural cities (San Francisco Bay Area and New York City), where people were mostly very tolerant and open-minded, and where there were always so many “ethnic” options. In New York if I missed Pakistani food, I could quickly hop over to Haandi or Lahori Kabab Restaurant on Lexington Ave for a hearty, spicy, almost-authentic meal; if I missed the music and dancing, there was no shortage of Bhaṅgṛā– or Bollywood-themed dance clubs; and if I missed Urdu conversation, Pakistani jokes, or just reminiscing about home, there were many lovely people from Pakistan whom I knew from before or had met in the U.S.; and we congregated quite regularly for these chai-biscuit sessions. In Spain, the experience has been a little bit different. There is hardly any Pakistani or Indian community in Madrid. The American or British expats mostly hang out within their own cliques. Madrilenos are very warm and welcoming, but language is the biggest barrier to cross before you can really feel like a part of the city. Still, we are very new, I’ve started learning Spanish, and we’ve already met some terrific people. So I am not too worried about settling in! During our recent year and a half in Pakistan, one thing I could not bring myself to get accustomed to was our culture of live-in servants. Even though I had grown up in that environment—and we were always taught to be extremely courteous with the domestic staff—it was very difficult to go back to it after living independently for so long. I think I experienced moments of displacement every single day, in my interaction with the servants in my parents’-in-laws home, where we lived. A part of me abhorred the idea of making a distinction between “them” and “us”—the employers, the masters. But the practical part of me knew that even the servants would consider it wrong, or strange and awkward, if I was to behave in any other way, outside of the conventional master-servant relationship. I also remember certain conversations, with friends or family, in which somebody would innocently discuss: “Where should the new servant girl sleep? Not in that empty bedroom upstairs, no—she may steal something. Perhaps in the hallway?” To be followed by: “I bought a gorgeous new outfit from so-and-so designer’s store the other day—only Rs. 30,000 (US$280) on sale!”—probably ten times the servant girl’s monthly salary. I always felt so uncomfortable, and so out-of-place, for feeling uncomfortable—yet powerless to do anything or say anything that would make any difference. What was your least displaced moment, when the peripatetic life made sense, and you felt as though you belonged in the Western world? For me, feeling at home somewhere is all about making meaningful connections with people, and being free to be yourself. It doesn’t matter where you are, and it need not necessarily be the land of your birth. One of the places I felt most at home at was the International House in Berkeley, California. A six-story dormitory for both American and foreign students at UC Berkeley, the I-house was a cozy, colorful, microcosmic universe in itself. There we were, young people from every corner of the world, each with our own unique culture, language, background, story, sharing the singular experience of studying and learning in a foreign land, a new place; a place that was beautiful and accepting of our differences, that celebrated our diversity. Even an ordinary meal in the I-house cafeteria—notorious for its tasteless food—was an adventure. I could be sitting next to a Lebanese civil engineer on one side, a Japanese-American graphic artist on the other; an Italian composer and a Korean mathematician in front; and conversation never ran dry. We laughed a lot, and learnt much from each other; and we never felt alone. That life wasn’t “real,” I know; it was and could only be a temporary phase. But I cherish those memories everyday. My one-year fellowship at Democracy Now in New York was a similar experience. We were a diverse, energetic team, united by a shared vision; and we all loved our fair-trade coffee and double-chocolate cupcakes! How about during your recent sojourn in Pakistan: despite your conflicted feelings, were there moments when you felt entirely at home? As for Pakistan—it is and always will be home, home at the end of the day. What I loved most during our recent sojourn was traveling within Pakistan. We explored the Karakorum Mountains, the Hindukush, the Himalayas, the Salt Range. We camped by flowing white rivers, under dazzlingly starry skies. We ate unbelievably delicious chapli kababs at nameless roadside restaurants, washing them down with steaming cups of sweet kaava. We tracked brown bears and chased golden marmots in the second-highest plateau in the world. We had tea with a jeep-driver and his eight daughters in their warm three-room cottage on the hillside. I discovered a Pakistan that I had never known before—a Hindu Pakistan, a Buddhist Pakistan, an animist Pakistan, the ancient Pakistan of the Indus Valley Civilization. A much richer Pakistan. And being outside of Lahore, outside of the noisy, constricted city, I felt at home. I felt like another character in the sweeping history of this aged and beautiful land that I loved, yet did not conventionally fit into. I understand you also use photography as a creative outlet. Can you share some examples with us? 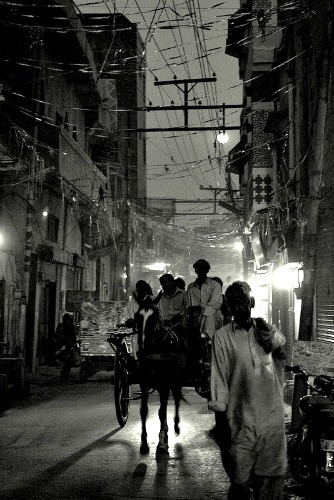 I took this photo in the Old City of Lahore last summer. It was early evening, and the moon had just come up. All the different sources of light—the full moon, the halogen lights in the shops, the headlights of the motorbike behind the tonga—gave the scene a very magical, unreal feel. I love the lights, the shadows and silhouettes in this photo, as well as the depth of the crisscrossing cables overhead, fading away into mist. I agree, it’s enchanting, and the cables are an amazing juxtaposition. I believe you have one more photo to share? Yes, one that I took this summer in Deosai Plains, the second-highest plateau in the world, located in the remote Baltistan region of Pakistan. This region is also home to K2, second-highest mountain in the world. We were crossing the plains in jeeps, when we came upon a caravan of gypsies, traveling in the opposite direction with their children, mules, dogs and horses. I cannot find any information about these people, where they come from, what their destination is, even what language they speak. 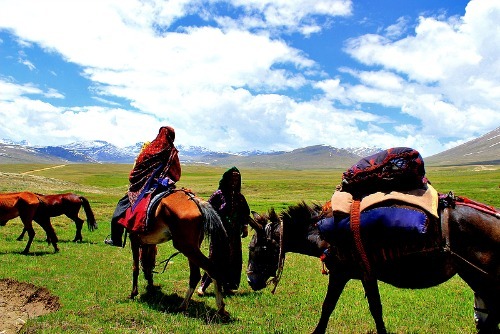 But they make the trek across Deosai Plains every summer. I love the clarity of this photo, the crispness of the colors; and generally I loved the mystery of these people, in this remote, unpeopled part of the world. What are your writing plans for the coming year? Will you attempt to put some of your writings together in a book? I wish! Writing a book, either a novel or a collection or short stories or essays, is definitely something I hope to achieve within the next five years. For the coming year, I want to focus on writing regularly on my blog, about my adventures and experiences in Spain, from multiple perspectives of displacement! I also want to continue the translation, or “transformation” of Pakistani fairy tales into English. 3. Reading habits on a plane: I always take one book with me, normally a novel, slim enough to stuff into a handbag, easily readable but thought-provoking: e.g., The White Tiger, by Aravind Adiga. 4. The one book you’d require Mamnoon Hussain to read, and why: He is so new to the Pakistani political scene that I really don’t know much about him! But I would recommend every Pakistani leader to read Jinnah, Pakistan and Islamic Identity, a revisionist biography of Pakistan’s founding father, by Akbar S. Ahmed. 5. Favorite books as a child: The Anne of Green Gables series, by L.M. Montgomery; The Faraway Tree Stories and The Famous Five series, by Enid Blyton; Chronicles of Narnia, by C.S. Lewis; all of Road Dahl; abridged versions of Jules Verne. 6. Favorite heroines: Anne Shirley of Anne of Green Gables and Scheherazade of The Arabian Nights. 8. Your reading habits: I read mostly at night, before bed, or while traveling, or on lazy afternoons curled up on the sofa with a cup of tea. 9. The books you’d most like to see made as a film: One is a novella by celebrated Indian-Muslim authoress Ismat Chughtai, translated from Urdu as The Heart Breaks Free. The other is a collection of satirical short stories by Naguib Mahfouz, titled Arabian Nights & Days. I would love to see both these works as short films, and maybe even produce them myself one day! 10. The book you plan to read next: Don Quixote—because I am in Spain! Thank you, Manal! I must say, I love how you combine the spirit and creativity of Anne of Green Gables with the story-telling power of Scheherazade! 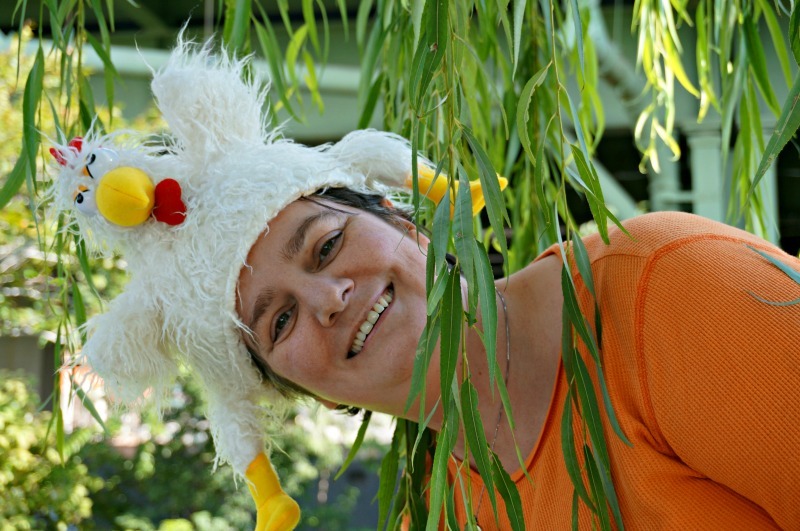 Like most gifted writers, you are still a child at heart! Readers, do you have any further questions or comments for Manal? Once again, if you want to read more of her insights, be sure to check out her blog, Windswept Words. 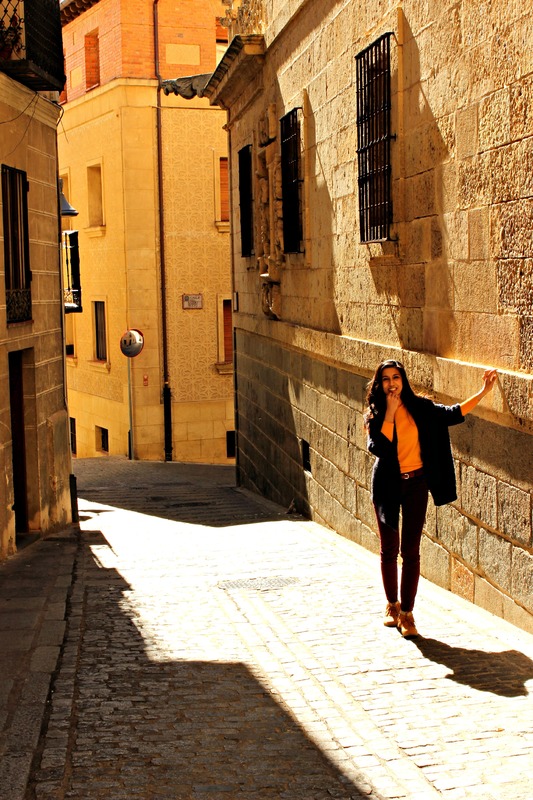 Main image at top of page: Manal Khan, taken by her husband on a day trip to Segovia. All other images are by Manal Khan, and are posted here with her permission. Joanna Masters-Maggs, our resident repeat-expat Food Gossip and Creative Chef, is back with her column for like-minded food lovers, which includes pretty much every expat we’ve ever encountered. This month: Upholstering armchairs to the tune of Mary Berry. I haven’t been cooking much this month. This is because, instead, I have been totally absorbed in reupholstering an armchair for my daughter’s bedroom. Like so many “trailing spouses”, I am an International Jack of All Trades and, possibly, Masters of None. Work visas are rarely applied to spouses and we must do what the current location allows us if we wish to work. In my time I have taught English (yes, I have a qualification), arranged flowers (basic qualification), taught exercise classes on a Saudi compound (absolutely qualified with first aid certificates to boot) and baked and decorated birthday cakes (the qualification here is hard to pin down, but I am very enthusiastic). My latest enterprise, however, is gripping me, and might well be what saves me from permanent life as an expat dilettante. Over the years my four children have wrought destruction on all our soft furnishing, but the sofas have suffered the worst. In part, I have been loath to recover them, as they represent something of both the material culture and culinary history of our family. The stains, ever more poorly hidden by artfully draped throws and cushions, track the growth of the children from breast to solids. Here and there are the stains of snacks smuggled from the pantry or the marks made by friends I felt woefully too weak to upbraid. Perhaps I’m just too English to tell off other people’s kids successfully. My “Take the hamburger back to the kitchen before I am forced to beat you” delivered mildly with a smile and a wink, is taken as face value and ignored – I should expect no more, really. Anyway, confronted with an upholstery bill that reached into five digits, I decided to take another “Have a go, Jo” course. The result is that I can no longer visit a friend’s house, or watch a film or TV, without becoming entirely distracted by the chairs and sofas on display. This new interest has caused me to all but abandon the kitchen. Meals are late and gracelessly served. Plates generally consist of pasta with a side of chopped tomatoes, cucumber, and sundry vegetables dragged from the back of the fridge or freezer – anything to make up the 5 a day and free me to return to the basement. I’m amazed that my family is bored by this approach. Perhaps they need a little footstool project of their own. Thankfully for this webpage, this dearth of food-related happenings in my household has been tempered by my need to listen to radio or TV while I work. This month I caught up with Great British Bake Off: the perfect accompaniment for the stripping and recovering process. If you haven’t yet discovered the delights of this quintessentially British of “competitions”, I recommend a quick rifle through YouTube. I’m sure you too will be hooked. None of the competitors claim that winning the show is their dream, or assure us that they must win because they want it so bad. That they don’t do so on a televised competition comes as a surprise and seems to suggest that things back home have changed more than I could ever have guessed. So accustomed are we all to naked ambition and self-puffery despite slender talents that the shock of modesty seems inconceivable. This year there was even a competitor, Ruby, who was so self-effacing that she became a hate figure in the press. Holding up her various offerings and apologizing for their variously burned, dry or just plain terrible states, she seemed to hail from a bygone age, ignorant of Simon Cowell. But today this is mistrusted and seems to be insincere, even manipulative. Interestingly, Mary Berry, the rather strict octogenarian judge, was quick to comfort and reassure. Modesty has been lost to the British TV in 15 years of TV competitions in music, food, modeling and god-knows-what. The public might mistrust Ruby’s handwringing over her uselessness, but Mary did the proper thing and bucked her up. What, really, is so wrong with such a world? Where am I going with this? Welcome to the wandering mind of someone whose hands are deep in boar’s hair and webbing. I’ll tell you where, though. It occurred to me that, since this hugely successful show had been spun off to many countries, each tweaking it to its own tastes and state of mind, I could find the French version and improve my lamentable French while never pausing in my upholstery endeavours. Well, strike me down with a langue de chat. You see, Charlotte Royale wasn’t English, it was French. I knew this, because it had appeared only a week before on English T.V. and during French Week, no less. Charlotte? C’est un French name, non? The French presenter thickened the plot further, introducing a historian to explain the English origins of the dish. Apparently, it was invented by Antoine Carême (yes, the father of the art of patisserie) who worked at both the English and Russian courts for a time. You see? Strange, no? He made it for either a Queen Charlotte, a Princess Charlotte, a cousin Charlotte and then at some point tagged on Russe to include the Tsar in his flattery. So why is this not considered French if a French man really did invent it? Patrick sharing his British Charlotte Royale. In France. Patrick, my 9 year old, and I, decided to make the British version. Doing it for myself cleared up all my questions. It was, let’s say, a woman of substance. French Women Do Not Get Fat, and their puddings cannot be hefty either. My own Charlotte Royal was no slip of a thing. The Swiss Roll lining was easily managed by Patrick working alone with our trusty KitchenAid. While the French contestants piped boudoir biscuits to surround their moulds for the light bavarois filling, Patrick sliced up jammy sponge rolls which gave the pud a slightly cerebral air when turned out. How can you cut a petite tranche from that? Piping even biscuits would be much more of a challenge for child and adult alike. The Swiss Roll is infinitely more forgiving. The difference between the French version and the English became clearer. Simiar amounts of work and skill are involved, but one must be elegant and the other must be generous. One should look preternaturally perfect, and the other is valued for comfort. A French dessert should perhaps make you feel you are not quite elegant enough to eat it, while the English makes you feel better because you do not look like the Duchess of Windsor. Ha ha – it is not generosity of spirit that holds the French back from planting the tricolor on this this dish. They are anxious that it is a recipe that can look unfinished, so trifle-like. When Carême returned to France, he apparently rechristened the dish Charlotte á la Parisienne, probably to soothe the nerves of alarmed locals who may have heard a thing or two about the English king Carême had worked for. 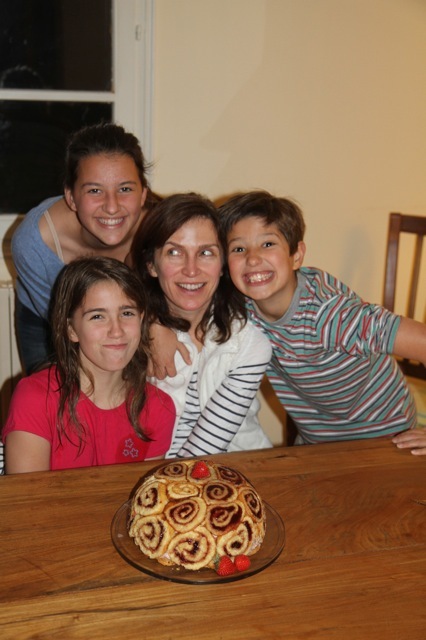 I have no doubt when Charlotte arrived on French shores she resembled a trifle as little as possible. Carême’s Charlotte is a little rootless, like so many of us expats. Like us, it is unsure where it belongs and if home will ever be home again. The Charlotte is perhaps a sort of Third Culture Dessert. But at least I think I may have found the name for my upholstery business if I ever start one. Here’s to Third Culture Sofas. Joanna Masters-Maggs, our resident repeat-expat Food Gossip and Creative Chef, is back with her column for like-minded food lovers, which includes pretty much every expat we’ve ever encountered. This month: Authenticity, Brazilian-style. “What’s the most depressing thing I’ve seen this morning?” I demanded of my husband as we arrived at our hotel on that first day in Brazil. Was it something in my tone of voice that made my husband stick out his jaw? Having your wife positive about a new location is always a good thing. Any hint of wifely discontent can put the terrors into most expat husbands, even the most rufty-tufty oil field types. “The favelas on either side of the motorway for the entire journey from the airport?” His voice had a slight tone of — could it be? — belligerence. He’d decided to meet head on what he feared was my Western European squeamishness over visible poverty. I’d agreed to come, after all; it wasn’t his doing that the favelas existed. Not the voice of a woman with a strong social conscience, then. “Aren’t we in Brazil?” I asked lamely. In my defense, I was afraid that this most exciting and culturally rich of countries appeared in thrall to the ego of a foreign superpower. Here, where Christ the Redeemer looks down calmly over Rio and Guanabara Bay, it distressed me that he was unable to turn his cheek from the abominable reproduction Liberty. Such are the drawbacks of being made of stone. My frustration really hadn’t abated much by the time we left several years later, but it was tempered. Here was a country that had its own great music, landscape, history and food. Brazil’s son Santos Dumont’s first flight had been overshadowed by the earlier but aided take off of the Wright Brothers’ heavier than air plan. But surely the same could not happen to Brazilian fast food – and at their own hands? Brazilian fast food choices, which can be grabbed on the run in a similar way to a hamburger, are extensive. Kibe consists of meat and bulgur wheat shaped into rugby balls and deep-fried. Empadhinas are little pastry pies often filled with palm hearts but options are endless. There are bollinhas de arroz (rice balls) and, a slightly more costly option these days, bollinhas de bacallao (salt cod). Then there is the coxinha. Oooh, heaven. It is a pear-shaped, breadcrumb-coated, deep-fried confection of pulverized chicken, creamy catupiry cheese, and onion. I don’t want to be rude, but for heaven’s sake, Brazil — how could you choose a chicken nugget over that? Please. It’s time for a Coxinhas R Brazil brand to sweep all before it. Turn the milk sour with your grouse? Or simply dance the samba? Brazilians probably have a greater openness and sense of fun than I do. They seem to tolerate kitschy statues and dodgy food for what it is, just a bit of fun not to be taken as a serious threat to national pride. There is a great deal of pride in being Brazilian and, I’m told, there are as many Americans trying to emigrate to Brazil as vice versa – it is a new land of opportunity. Brazilians seem less sulky or passive aggressive than many in dealing with what they don’t like. One amusing example came in the immediate aftermath of 9/11 when America required passengers arriving on planes to America from Brazil to be subject to the same security searches, and delays, as planes coming from countries deemed a threat. Brazil has no history of terrorism and people were offended. However a cheerful approach was chosen. Officials simply decided to apply the same principle to American planes landing in Sao Paolo, Brazilian style. To ease the pain of the wait, passengers were treated to smiling samba bands and charming dancers. Nothing was ever going to change, but the point was made and relations not permanently soured. Perhaps this non-confrontational approach is best. The invasion of American fast food is all-conquering everywhere. Its advance hasn’t been slowed by a thousand angry French farmers and restauranteurs, or by the Italian Slow Food movement. But its growth in Brazil alongside a rapidly emerging obesity crisis comes alongside economic improvements. According to a recent BBC Programme on the rise of obesity around the world and particularly in developing and BRIC countries, the answer is to be found less in the innate appeal of the food, but in the message that is sent out when you’re seen eating it. McDonald’s is an “aspirational food”. You might think you would aspire to a Wolf oven or even a Meile vacuum cleaner, but McDonald’s? No — bear with me. A Brazilian McDonald’s meal costs four times that of a plate of rice and beans. Its cost would buy you any number of coxinhas. It is impressive conspicuous consumption. You pay to eat a meal which won’t actually fill you and you will have to pay to eat again soon after, but the point is: you can. It’s a fairly modest aspiration for the new middle class. Thousands of Brazilians have been lifted out of poverty over the last 10 years. But potential hunger is still a recent memory and the fear of slipping back must be strong for many. An outrageously priced Big Mac is still less expensive than a ritzy restaurant in Leblon and it’s certainly easier to avoid potentially embarrassing etiquette gaffes for those not yet accustomed to what is known in America as “fine dining”. This is what fast food companies can trade on, and before you know it, new habits are formed. Why get fat on this so-so food, though, when you can get gloriously fat on real cooking? You can easily pile on the pounds with Brazilian feijoida, Let the weight gain be a result of leisurely, indulgent meals and not sandwiches grabbed in plastic furnished, fluorescent lighted “restaurants” that are tiled like public lavatories. I’d say the same to America. Ditch the McD and get fat on Southern and Soul Food, some of the most luscious food in the world. Wow, those Southerners know how to take a healthy low-calorie green vegetable and give it the cholesterol punch of cheesecake. My two personal favourites: collard greens cooked in fatty port cuts and sweet potatoes mashed with butter and topped with a crumble made of brown sugar pecans and a handful of marshmallows. Sounds appalling, but it is the closest thing to ambrosia since Zeus was a viable god to worship. 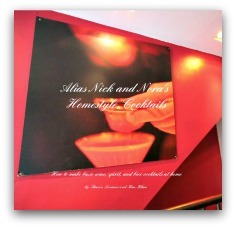 Both Brazilian and American Soul food has the opulence and indulgence to deaden and dazzle the senses at the same time. It has what a dried up hamburger and flabby white bun bread cannot hope to rival even with liberal dollops of ketchup. Oh please. Get fat on real fat and be patriotic about that: your nation’s fat. Make it worth your while. Make it worth your money. 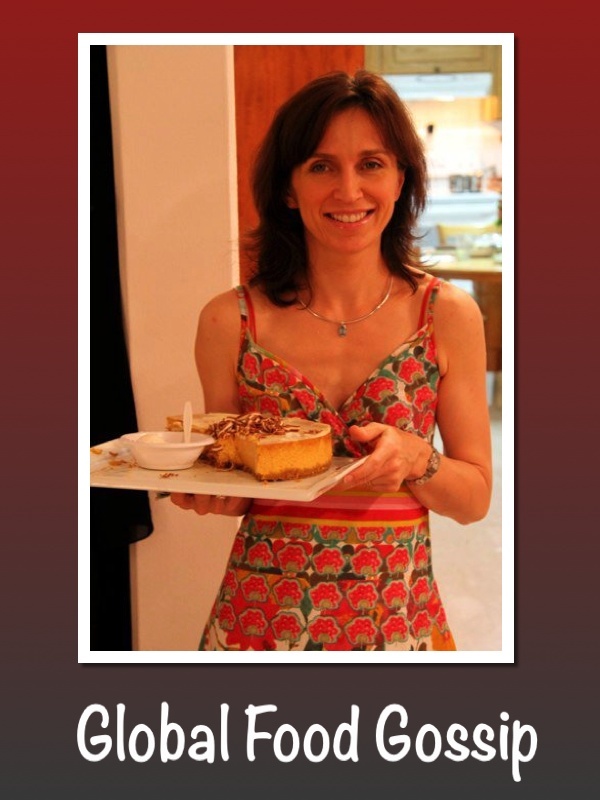 Joanna Masters-Maggs, our resident Food Gossip, is back with her column for like-minded food gossips. This month: The state of worldwide hospital food. So ended my husband’s texted tirade after a few days in an Abu Dhabi hospital following an emergency appendectomy which turned out to be less than straightforward. The indignities, pain, and discomfort could be handled with fortitude, but the food had caused the British stiff upper lip some serious challenges. Beetroot was served at every meal and in every conceivable form — none of which was remotely welcome to this convalescent. Almost unbelievably, the day after my husband was admitted to a Middle Eastern hospital, my 9-year-old son was diagnosed with the same condition and admitted to Taunton Hospital, in Somerset, England, for the same operation. Patrick took it all in his stride, only threatening mutiny when a disposable bottle, apparently made of the same recycled cardboard as egg cartons, was proffered in response to his request to go to the loo. With furious determination he heaved himself upright and made his way to the bathrooms, wheeling his drip ahead of him and making my heart swell with maternal pride. Several hours later, when wrinkled potato wedges and bright orange fish fingers confronted him, Patrick’s attitude was rather different. My husband’s texted complaint lacked the colour a human voice could give the words. My son’s anguished “Why, why, why?” however, provided a glimpse of The Husband’s state of mind when he composed his text. The pitch of “Why can’t I just have a tuna sandwich?” swung from already-stressed contralto to end-of-tether soprano. This question is one I ask myself every time I face airline food. Why not a sandwich? A simple sandwich is perfect food for those on the go; ask any hill-walker. It is easily transported and eaten and requires little in the way of tableware. It certainly beats sub-standard wannabe home-cooking, or, more depressingly, wannabe gourmet cooking. KLM used to do a nice sandwich on granary, a little oatcake and a good cup of tea or coffee on their London to Schiphol shuttle. I have never enjoyed airborne eating as much. Flights since, even champagne-soaked upgrades, have never hit the spot as well. Hospitals, like airlines, are susceptible to the curse of being the girl who tries too hard at parties and embarrasses everyone, for different reasons of course. Airlines because they feel they are part of the same package as the business trip or holiday and have to provide something special. Hospitals, being in the health business. feel under pressure to produce something healthy and balanced. Easy healthy and balanced is a lump of protein, a lump of carbohydrate and some boiled veg. Each element can be whatever is readily to hand in the locale. Obviously, beetroot is easy to come by in Abu Dhabi – who’d have thought? A few years ago I found myself admitted with an unpleasant stomach bug to a hospital in Kuala Lumpur. During my recovery, meal after meal was placed in front of me, each consisting of overdone, indigestible chicken in glutinous sauce with rice and boiled vegetables. (Never talk to me again about English food.) Not appetizing at any time, but certainly not in the recovery period. At the end of day two I was begging for cream crackers and jelly. Even if I was unable to eat them, they were easier to tolerate the look of in the post-prandial two hours that the staff took to remove the debris. When I’m sick I crave the ideal Victorian sickroom. I want chicken soup, broth, and little crustless sandwiches cut into triangles. I want food that makes me feel pampered and I want it in miniature form. What I don’t want is big hunks of meat that I have to take a hacksaw to. I don’t want to bother with a knife and fork. I’d like little sips of water, or tea and maybe the odd ginger biscuit. Some soft-boiled eggs and soldiers (fingers of toast) would be nice too. In short, give me the whole Victorian sickroom vibe complete with flowery china and a little vase of flowers. Do that and I’ll put on a white nighty, brush my hair and smarten up my convalescent act accordingly. What explains this wanton disregard for dainty and light in preference for The Undigestibles? I suggest it is because hospitals the world over want us out, and want us out fast. In cash-strapped UK NHS land, beds are at a premium and waiting lists must be kept down. Make things too comfortable and delicious and who knows how long malingering patients will stay? I also imagine American insurance companies would like to minimize the number of nights their customers spend in hospitals which are often more costly than excellent hotels. So, what’s my point talking about all this in our “displaced” world? I suppose it is simple, really. I want any experience that takes place outside of my own country to be distinctive and of that place. If a hospital cannot, or will not, convert its menu into something I might find in Little Women, I want to lose my appetite for something distinctive. If I have some indescribably unpleasant stomach complaint and find myself again in hospital in KL, I want to be unable to eat Malaysian food, truly Malaysian food. If I’m not eating, give me beef rendang to reject and not boiled chicken breasts. If I am in Rio, I want to lose my appetite for black beans and chiffonade of couve (actually, that will never happen) and if I ever end up in a Abu Dhabi hospital, I want to reject grated raw beetroot. You see, be it Victorian pampered convalescent on a chaise longue, or expat overseas, I yearn to feel special when I am sick. Is that really too much to ask?